Happy National Walking Day! Walking is a healthy and easily performed exercise, and it is what defines us a members of the human race. So grab your dog and perhaps your bud, and let’s start taking the “steps” towards a healthier life! How Should I Start Walking? 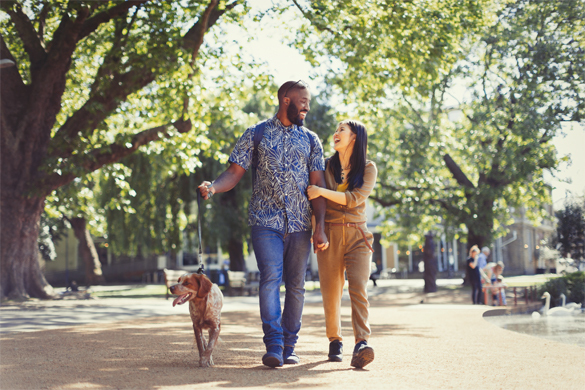 To begin experiencing the benefits of walking, it is important to start off slowly—especially if you have grown accustomed to the life of an average couch potato. For starters, you should make sure you have the right equipment. Wear shoes that provide good arch support and cushion your feet from shock. If you walk at night, be sure to wear bright clothing that catches the light, as well as reflective tape. It also helps to plan your route. Always put safety first, and choose a path that you’re comfortable with. Try to avoid back-alleys and, if you can, ensure that someone you trust is always aware of the route you plan to take. At the beginning of your walk, be sure to take time to warm up. Start off walking slowly for at least 5 minutes to help warm your body and ready your muscles for exercise. When walking, it is important to do so properly. Walk in a relaxed position, with your back straight—but not stiff. Make sure to roll from your heels to your toes as you walk, and keep your head up—looking forward. At the end of the walk, allocate time to cool down and stretch. Walk slowly again for at least another 5 minutes to help cool down. When done walking, be sure to stretch your muscles. According to the HHS, you’ll want to be participating in exercise for at least 150 minutes a week, which comes down a half hour every weekday. However, don’t worry if you can’t reach this goal immediately, as it is important to reach it gradually. Try to start with walking at least 5 minutes a day per week. Then you can increase the daily exercise by another 5 minutes every week that passes. Eventually, you’ll be achieving things you once thought out of your reach. It is also important to remember not to be too hard on yourself when you skip a day. We are human, we make mistakes, and life happens. This article will be part of a series on cardiovascular exercise routines. Tune in next week as we discuss the benefits of running! Whenever starting a new workout routine, please be sure consult your primary care physician. For more information regarding exercise, feel free to read our related blogs or schedule an appointment with Healthpointe.